We cannot be against diversity, versatility. When it's good, when it's out of the ordinary; we have to talk about it. As long as it stays in the sphere of EM. I think among others of the music from the Ultimae Records label which nests on this Blog and which enriches my listening hours with some great psybient, hypnotic psybeats and smooth down-tempos wrapped by a superb sound fauna that will please to the most of refractoriness ears to this musical genre. 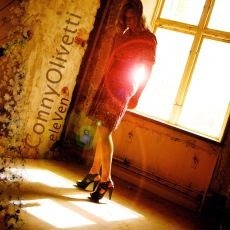 It's in that context that Conny Olivetti, a Swedish artist who is rather active in the creation of music for movies or TV shows since the 80's, has contacted me in order to present his last album “eleVen” to the readers of this blog. Also involved in the activities of the Swedish band wHaT iF, Conny Olivetti as knew how to diversified his sound pallet by mixing to his creations the fruit of his influences which go from Kraftwerk to Vangelis, while passing by the music of Eno, Cluster, Roedelius and Faust. This diversity of the styles and of all forms of beats perspires on his 11th album which is an immense eclectic sound mosaic where the dialogues ooze from the sonic walls in ambiences twisted by iconoclastic noises and where the rhythms of electronica convoit other skeletons in revolt in order to surprise the hearing. Inspired mainly by the English series The Avengers, “eleVen” entails the listener in sonic corridors filled by inquisitor voices and by city noises which perfume these rhythms in perpetual fusion and those ambiences of dark city perfumed by some delicate sense of psybient and where the influences of Vangelis, in particular his album The City, are at ringside seat. We frown from both ears at the approach of "Tara King - part one, two, three". The pulsations which darken the fragile jingles seem to mold a pleasant down-tempo. And the voice of Linnea, singer of wHaT iF, comes to caress our ears with a timbre of a young virgin. Slowly, the structure kisses a techno mood where some brief series of stroboscopic chords remain stigmatized in the somber linear palpitations of a tempo which pounds and oscillates constantly between the synth-pop and a soporific techno, except for a finale which injects in our ears this madness of percussions, here the mixture is felted and metallic, that Kraftwerk thrown between our ears with the tumultuous Metal on Metal from the Trans Europe Express album. 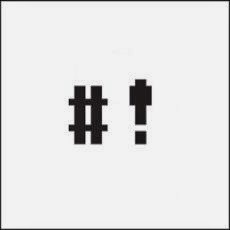 Each track on “eleVen” are closely segued, presenting thus 2 sonic acts of 45 minutes where the ambiences dominate the rhythms. If "Breakable Furniture Dies" is closely tied to the first track with a rhythm which remains as evasive as muddled , it changes of harmonic finery and stands firm on its approach of mid techno and mid synth-pop in an ambiosonique envelope which transcends the simple impression of hearing the heroes roam in a city. "Mother Night" follows with a veil of cybernetic moods where noises of all sort are rushing at full scale all over our ears. Pulsations which sound just like percussions hammer an absent rhythm while a sinister voice roves between some ringings of bells. "Behind the Massive Ball" is in the same pattern with ambient voices and noises which this time evaporate in the hits of good percussions and the rush of stroboscopic lines which have escaped from the opening track. It must be a kind of psybeat because my ears move more than my feet or my fingers. But the effect is rather lively. With its tribal essence of the Middle East on a soft beat, "The Interrogators" is my first real crush on “eleVen”. The flute here is magnetic and these percussions which sparkle with some kind of suggestive breezes add a subtle psychotronic dimension to a good down-tempo of which the outlines are a little less defined than on the very good "Blue Sky" whose lascivious rhythm is superbly cloistered in a psychedelic atmosphere. The voice of Linnea makes a good contrast with synth lines and their harmonies as evasive than secret. I liked, even if we are far from the frames of Berlin School. And the more we move forward and the more we are wrapped by the charms “eleVen”. "Google Yourself" is a great track with its finely bouncy structure of rhythm, one would say a kind of morphic reggae, and with its spectral voices which remind me of some somber voodoo incantations. It's another very strong track here. A track such as "Noize Centralis" does not need to be describe. Except that I like this symphony of weird noises which collapse under a pleasant synth cover. "Conclusion - part one, two, three" concludes the first act of “eleVen” with a structure similar to the introduction. It's without the voice of Linnea, but with many more noises on the structure of rhythm which wonders constantly if it has to move forward or stop. After the very good inverted spiral beat of "The Descending of the Nazca Plate", boy do I like these linear movements which make of stop not go and which crawl such as stroboscopic grass snakes constantly on the hold, which swirls in a great Arabian structure, what a lovely fluty air, CD 2 of “eleVen” proposes us a clearly more ambiospherical, a more ambiosonic, approach where the rhythms beat with the fear of bursting in an immense pattern of television noises. The dialogues, the rainy drops, the city noises and the glaucous rustlings of spectres, I'm thinking of "Ghost" of Macula" et "Relax", as well as these strange noises which feed the skeletons of rhythms and the harmonies in fusion, like in "Imagination" and "More Ivory", are dominating the rhythms a little bit synth-pop, "Man vs Woman" which reminds unmistakably of Kraftwerk mixed with Sneaker Pimps, or even a more techno genre as in "Oriental Device" and its ambient envelope which inhales a little bit the fragrances of Berlin School. "Outrage at Tranquility Bay" ends this rather interesting album of Conny Olivetti with steady beatings which resound under synth lines filled of spectral airs and in the harmonies a bit lost from a delicate piano which sounds intimidated by this heavy sinister approach. So much, that it cannot complete its harmonies. I kind of liked this first contact with the very effervescent universe of Conny Olivetti. I like these skeletons of rhythms which are strolling around and are looking forward to imploding and breaking off the small bones with soft movements which seduce just as much as these ambiences, sometimes futuristic or tribal, which embalm “eleVen” of a very Vangelis perfume. I believe that those who enjoyed the moods of The City and those who like the psybient or psybeats structures of Ultimae Records will be in the 7th heaven with this last album of Conny Olivetti. Some sonic cracklings generate a thick cloud of reverberations from where escapes a warm movement of sequences which makes dance its keys weakly. Another line of bass sequences lifts up the structure of ambient rhythm of "A First Encounter" which zigzags, rises and comes down beneath the tears of a very melancholic synth. The Emmens seal seizes then our ears. Initially mid-ambient, the rhythm is pulsing delicately in the motionless harmonies of the sequences and in the breezes of a synth rather discreet up to here. A line of sequences escapes a little after the mark of three minutes, pulling the track towards a more cosmic passage. It's a bridge that Gert Emmens sets up to redirect the rhythm of "A First Encounter" to a more accentuated phase where the sequences gallop such as dark percussions in a plain flooded of breezes and of cosmic fogs. A synth scatters some solitary notes which beautify the firmament of nebulas stars while the rhythm sustains its swiftness with sequences which flicker such as the wings of big bumblebees trapped in linear winds. After another ambient phase, the rhythm increases its kind of stationary swiftness with a thick cloud of sequences which sparkle and shine on the undulatory curves of a line of more pulsating bass sequences. This duel of sequences is decorated with percussions of which the felted tones go and come to peck at this soft oscillatory rhythm which rocks its obedience in some slim filets of bright astral voices. Violent? No! Soft and surprisingly enveloping, "A First Encounter" flows with the color of our dreams which imagine this space cowboy who quietly drifts in the “Outland”. It also puts up the parameters of this last album from Gert Emmens where the ambient rhythms change constantly of skins in cosmic ambiences with a sound quality which details aptly the scenario and the visions of his author. Reaching the goal of his mission, the astronaut and his Cyborg subalterns observe the disappearance of the civilization. "Discovery of the Lost Civilization" depicts with wonder the feelings of dejection, as well as the internal anger, which eats away at the cosmonaut. The synth here is more present. It blows some very good ambient solos and sweet evasive harmonies, dragged out by this feeling of abandonment which torments this hero whose purpose of his mission will remain forever unknown. The structure of rhythm evolves constantly with lines of sequences which interchange the debit always unctuous, while the synth splashes these permutations of internal violence with soft solos to the aromas of jazz and solitude. Composed with Ruud Heij, "The Temple on the Sacred Mountain" is purely ambient and follows the paths undertaken with Signs, just like the finale "Departure 6 AM", also written with Heij, which is darker, while the delicate solos and the soft harmonies of a synth and a guitar enhance these sweet visions of exile which surrounds "The Temple on the Sacred Mountain". Although always ambient, the rhythm of "Return of the Warrior" is more incisive. The sequences are bright and cut out the ambiences with curt and lively hits, drawing the lines of a harmonious structure that a synth is decorating of evanescent melodies and with soft solos to the fragrances of saxophone worn out by its solitary airs. The rhythm reveals a more lively structure after a good ambient passage, drifting and fluttering with a velocity unequalled so far in this album where the nuances dominate the moods. "Exploration Flights over Forbidden Area's" is a long musical act, and the best imho on “Outland”, which presents a structure of rhythm in constant progression. A structure which rises and comes down, dies and reborn in schema of zigzagging and galloping rhythms from which the lines of bass sequences stride along corridors of ambiences adorned by other sequences and by their shadows which sparkle and flicker in abyssal waves. A piano comes to haunt these moments of blackness with a very melancholic presence which serves as passage between the crystal clear rhythm of the introduction towards a heavier structure. It sounds like the aircraft is lacking gasoline and has difficulty in overcoming the obstacles of the winds from Orion. Riding silky in the corridors of a cosmos now freed from its dark breezes, "Exploration Flights over Forbidden Area's" cavorts with a bit of sadness in the organic resonances of its steps and in the luminous beams of more melodic circular sequences. The progression of the rhythmic phases is quite smoothly made. Gathering in its evolution the ambient ornaments which roam on this long polymorphic structure where everything seems to be in suspension. Some elements of threat, as of tragedy, encircle the phases of "Exploration Flights over Forbidden Area's" which concludes its odyssey with a superb mid-tempo approach where bass sequences are waving in the fields magnetized of eclectic mist and adorned of soft solos from a synth became again dreamy. 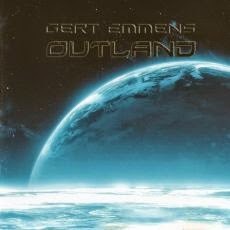 A synth which sometimes unearths souvenirs of a melancholic Vangelis, a rather unique synth which adds this fascinating scent of obsession which surrounds “Outland”; yet another small jewel which should appear unmistakably among Gert Emmens' good works. Those who follow my reviews know how much I like Jerome. So I took a chance with this first part of a trilogy to come entitled Orange Sized Dreams. According to the guide of press, OSD is a personal collection about the music that Jerome has composed during his years with Tangerine Dream, be from 1990, with Melrose, and 2006, with 40 Years Roadmap To Music. 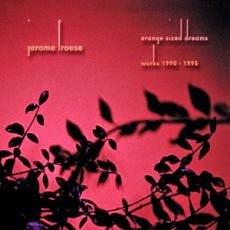 The first part, “Orange Sized Dreams (Works 1990 - 1995)”, covers the periods of Rockoon to Tyranny of Beauty, including the 220 Volt Live year, we find 5 tracks from this album here, plus some leftovers, unreleased tracks which didn't make it on the first Dream Mixes album back in 95 and 3 overhauled tracks that Jerome totally re-recorded in his studio this year. The whole thing starts with a studio version of "Backstreet Hero". The energy, the electricity from 220 Volt Live album is so absent, but the track spits all the same its ardor. On the other hand, "Two Bunch Palms" is more furious. A bit wilder and not bad at all. I also prefer the version of "Treasure of innocence" which is more rock, less ethereal. And what good guitar solos we have here. If the rehearsal version of "220 V" left me on my appetite, it's the even worse with "Cymbeline" which is a version of the wild and furious Hamlet that I consider without passion here. It's more electronic, mostly ethereal and downright less rock. And for each of these tracks, even the good studio versions, the electricity which was getting out of 220 Volt Live, which is a real blow of mass between the ears by the way, is lacking. I once again took 220 Volt Live out of the balls-of-moths and keep it playing in loops for a good week. So, thank you Jerome for this blow of nostalgia. Linda Spa's saxophone in "Little Blonde in the Park of Attractions", from the Tyranny of Beauty album, is totally crossed off from the map here. In fact, did Miss Spa played in TD during the Jerome years? I'm saying this because all of her parts are totally erased on this “Orange Sized Dreams (Works 1990 - 1995)”. Unless my ears are playing tricks on me here. You know...Sax versus synths. This new version outlines even more this nice opposition of the phases between the ethereal moments and those heavier with a Jerome in total control who shows all of his abilities behind a console in a studio. I prefer this version, although this kind of ballad which dance between a soft e-rock and New Age has never attracted me. Here, it's someone who has never stand the Dream Mixes projects who is going to write about of its 2 leftovers that Jerome has overhauled in order to give them a more techno, more danceable approach. Thus I didn't really liked "Agent or Police?" which has an abrupt structure of rhythm with very furious bass pulsations and percussions which roll with insanity. On the other hand "Comfortably Numb", although heavy and hopping like some good Chill House, seems to me more melodious. But I understand why both tracks were leftovers. I didn't really noticed some differences between this "Jungle Journey" and that of Turn of the Tides, set apart that it seems to me more stifled, distant. Anyway, I don't really understand this thing called Uncooked Version! And what about this thing named Angels vs. Devils Mix? It's the seal of this new version of "Penguin Reference" which has also lost its saxophone airs. But that doesn't make of it something more furious. It remains a beautiful melody, with a better contribution of the percussions here, which shines a little more on this “Orange Sized Dreams (Works 1990 - 1995)”. Did I like? Not more than that! If I liked some of the remodeled versions of tracks that we found on the 3 studio targeted albums by “Orange Sized Dreams (Works 1990 - 1995)”, I also found out on the other hand why leftovers were leftovers! The music we heard on 220 Volt Live and of which Jerome reworked here leaves me perplexed. If some offer more dynamism, the portions of saxophone being totally erased, the lacking of electrifying mood which was the key of this superb album wear a shade at the good arrangements. And this we cannot take it away to Jerome; he is beast in a studio! A beast who leaves some beautiful sound imprints, even when his needs to track new preys is not totally justified. Hey, does Jerome's busy! Besides being very present with Loom, he works on tracks that he wrote or co-wrote during his years in Tangerine Dream in the Orange Sized Dreams trilogy and he also simmer another small project, always unknown to date, which is promised to be quite a pleasant surprise to his fans. In order to avoid these fans, of whom I am, to wait too much for new music, he has released an EP at the same moment as Orange Sized Dreams (Works 1990 - 1995). “# ! (Shebang)” is his first EP, and new music by the way, since the making of the boiling single Einzelkind, released a little before his last studio album (Far Side of the Face), back in 2012. Well! Don't expect to be thrown down of your chair, because Jerome is rather honeyed on this EP of which the name moreover sounds like a threat for a wilder music. Hum...But the taming is worthy of the final result. When I looked at the artwork of “Tiere”, I had as a movement of surprise. And not in the best sense of the word. Drawings of animals, because Tiere = Animals, fixed on cardboard by childish hands! Let's admit that it is kind of unusual. I had the impression to look at the first drawings of my children. A little as if we were thrown years behind. And this is a little the feeling we have when listening this 2nd album from the German duet Q2. Contrary to Asteroid, which was a lot more of a progressive kind, Frank Husemann and Sunny Vollherbst concocted us an album where the simplicity is the base of everything. 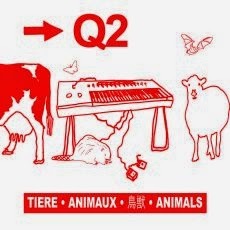 “Tiere” is a very Teutonic electronic rock album where Q2 transforms simplistic hymns into monuments which cement our ears with simple things which hook the attentions, even if the duet likes to insert dysfunctional elements into some superb melodies which amaze, both by their spontaneity and by their efficiency. And that begins with "Wolf". The first oscillations get lost in an union of percussions and guitar chords which drum and spit a very catchy Teutonic rock. The introductory rhythm is hooking immediately the ears, the senses and makes stomp. Riffs comes to peck at this moderate race while that clouds of ether are floating by pads, just to remind us the basis of EM. The rhythm remains steady. This is light lead in the ears. Minimalist? One can say, just like all of the rhythms which beat in “Tiere” moreover, but with fine variances which delight the listening. Here, Frank Husemann's guitar, and even if his play remains sober, distorts the race of "Wolf" with just enough subtleties in the tones of his six-strings to make subtle changes in the pace just as much of the knocks of those robotics percussions. I quite liked it. I had the impression to hear a James Bond hymn played all crooked. It's a great e-rock, a pure earworm, a la sauce Kraftwerk. And even if the spirit of Kraftwerk is floating all over the 8 tracks of “Tiere”, we have difficulty in identifying the era. I would say that it's pre-Authoban or still The Man Machine times, like "Kater" where the rhythm is as much fluid and the melody is incredibly catchy. The music and the melody is anchoring in the ear, even if its finale is as much indomitable than a cat in heat. "Schmetterling" also offers a beautiful melody weaver of earworm. The keyboards resuscitate these old analog tones which charmed, like these old organs that were lying about in almost every family in the 60's. The rhythm is hopping, elastic with bass chords which grumble and percussions which spit white noises. "Bieber" takes back a little the cybernetic beatings of "Wolf". It's a mixture of e-rock and synth-pop with a bass line livelier than the percussions and a guitar which is less harmonious than on "Wolf". A little in the genre of "Loewe" which is heavier, more indocile with a guitar full of wah-wah effects. "Fledermaus" is a darker, a little less accessible where the percussions sculpture a continual thunder and where the waves of guitars and synths draw the sensory languages and the threatening mass movements of bats. Let's say that the music reflects aptly the idea behind the title. And it's also true for "Schmetterling" by the way. All the opposite of "Kuh" which is a kind of very catchy rumba, while "Alder", which is a little bit in the same style as "Fledermaus", draws marvelously the winged movements of an eagle. The rhythm is rather ambient at the beginning. It prepares its flight on slow dark keyboard pads. And a little as the eagle, which it is exactly the sense of the track name, the music fits the flight of the bird of prey which glides like the quavering percussions and the impulses of a bass line. The wings adjust their swiftness, bringing the nervous and tremulous rhythm of "Alder" to the top of its destination. And it's the descent.... Ambient and psychotronic. Two elements which decorate with aptly and shades a pleasant, and audacious at times, album which reminds us a little the genesis of EM. Whoosh...! We are not yet sit that the sequences plough a lively rhythm. The keys cut out the air with sharp hits. They sculpture a furious sinuous race which hang on to pulsations beat up by a bass drum. The riffs which fall and scatter derisive harmonies, as well as these synth pads which come from metallurgical sources, don't lie; we are on familiar ground. We are in the den of Arcane. In the den of this group whose legend is closely linked to that of Tangerine Dream. Moreover, who is whom? The question arises. Because all through “Revenants” we have this delicious sensation that both myths make only one. The title-track assails our ears with a furious rhythm, braided in the analog perfume, which runs to lose breath through the sonic traps which rush on both sides of our ears. If the sequences and percussions forge a solid e-rock, the guitar spits its gall by roaring as a starving animal. And because the rhythm empties its reservoir of furious keys, brief moments of calm regild the decoration with delicious foggy pads and keyboard riffs which bring out the analog years. "Revenants" sets the tone to an album that plunges us literally in these years when Tangerine Dream amazed the circle of cinema, movie makers, with hard-hitting soundtracks. From Flashpoint to Thief, while passing by Wavelength and even Near Dark, for the effects of fright, without forgetting Green Desert for the analog perfumes this last album of Arcane follows the moments of madness of Holocaust 300 and offers 8 tracks where the rhythms have the upper hand over the ambiences and where the melodies, the harmonies tame an apocalyptic vision which fits closely to its rather significant artwork. If "Revenants" rocks the house down, "Contagion" brings us to a more sinister level, just like "Unnatural Selection" which presents an even more unpredictable structure. A line of sequences stretches its keys which skip hurriedly in the shadow of others, moulding a heavy stroboscopic filet which goes and comes through intriguing and lugubrious synth pads. The ambience is like being in a video game where the hero has to search tunnels full of traps. The percussions are sober and feed a rhythmic heaviness. And if the rhythm is ambient, it remains decorated with threats and with elements of fear where riffs, metallic jingles and howling voices intensify a sepulchral climate. The sequences eventually keep a pulsing fixation, forging a linear and livelier rhythm from where emerge other sequences among which the harmonious approach, as well as the addition of more lively percussions, accentuate the pace of "Contagion" which preserves nevertheless its threatening envelope. A mood which overflows on the sinister "Fire and Rain" and its rivulet of sequences which sparkle under the thunders and in the knocks of heavy muffled pulsations. The rhythm livens up in the form of a slow gallop where are fluttering crystalline keys in the mist of foggy synth pads. We swim at height ears in ambiences, rhythms and melodies stamped by the influences of Tangerine Dream and it is not the very beautiful "From here to Oblivion" that is going to deny it. It's a charming e-ballad with nervous sequences a la Flashpoint, just like those lively of "Sunrise on a Desolate Freeway" which swirl and lose of their brightness in a heavy and slow tempo, always soaked with a vision of threats. I quite enjoyed "The Returned" and its heavy rhythm bombarded by muted pulsations and torn by riffs of a guitar, which is also capable of good solos in "Sunrise on a Desolate Freeway", from which its curt and edgy chords make contrasts with these silvery sequences which shake a cloudy rhythm. A rhythm which little by little accepts the swiftness from the flight of sequences to become as much harmonious than lively. There is a scent of Near Dark here. "Deadly Skyline" ends with an a little less darker approach. The rhythm is slow and raised on sequences of which the crystalline tones shine in the pulses of sober percussions. These sequences get loose to form a line of orchestral jolts, always adding this filmic weight which characterizes “Revenants”. A little like Edgar, Paul Lawler tortures his electric six-strings and places some evasive solos which melt into an artificial voice. And, according to the rules of the seven other tracks of “Revenants”, the rhythm exorcises its passivity. Dusting out its mortuary atmospheres, it gets hit of more lively percussions and runs away with the strange harmonies of this feminine voice which steals us a few seconds of those suave solos from which we distinguish with difficulty the nuances between a synth and a guitar. And always, we have this delicious impression to walk on the sonic, the musical paths of Tangerine Dream. 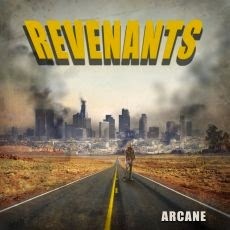 And this, Arcane is not offended! After all, don't they come from this wonderful time when EM could has been as well secret and intriguing than be charmingly mesmerizing and lively? Sequences with colorful tones of crackling a bit organic are drawing a structure of rhythm rough draft. A structure which zigzags with a movement of motionless ascent where the keys crackle in the muffled impulses of the bass sequences. And this rhythm takes refuge beneath the warm caresses of Ruth Koelzner's very ethereal voice. A voice which remains the key element of the title-track with some hot and incantatory breezes which float over a staggering, an uncertain structure of rhythm and which at times has to lean on the muted knocks of the bass pulsations/percussions. As if by magic, the sound universe of TM Solver wraps our ears with a multitude of ringings and percussions which ally the Tablas kind to those more electronic. Dramatic effects, pushed by the muffled impulses of the bass line, are also adding a rich depth to this pattern once again very well set by these sequences of which the hybrid tones are all the charms and Thomas Meier's signature. After an album inspired by the stunning landscapes of Iceland (Polymorph), the German synthesist launches simultaneously an album transported by the paradisiacal charms of Nepal's landscapes. Released on the Luna division from SynGate, “Namaste” is indeed a more ambient album. But not totally ambient! To say the least, not as we imagine ambient music. The rhythms are softer and sculptured through these sequences brewed with eclectic tones which are finely drummed and which skip peacefully in these envelopes of mist, in these chirping and these lamentations of synth which try as much to twitter than to sing, in these attractive orchestrations, certain tearful, and among which the effects of tenderness, meditation are cajoled by the voice of Ruth Koelzner. 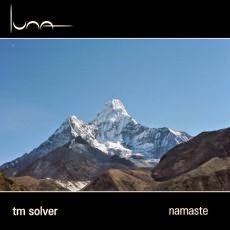 That might be on the Luna division, thus ambient music, “Namaste” is not really far from the usual hypnotic and catchy rhythms of TM Solver, in particular Polymorph where the last two tracks seem to have drawn the ways of this album that will seduce by its clearly more celestial approach. "Floating Clouds" presents these sequences and chords so characteristic of TM Solver's sounds and beats arsenal. They skip and dance weakly in the slow veils of the orchestral mists. The genre reminds me a lot the music of Software, but in a more emotional pattern with a synth which spreads its long tears on a structure of rhythm of which the swiftness takes root in muted knocks of pulsations. The slow rhythm adopts the shape of a good magnetizing lunar down-tempo which is decorated of chirpings and of electronic dialogues and especially caressed by the warm breezes of analog tones and others more silvered which melt themselves in the soft orchestrations of which the veils of tenderness cajole a passive rhythm which always seems on the point to overflow. The soft voice of Ruth Koelzner returns caressing our ears on the delicate ambient rhythm of "The Dream" which swirls on sequences finely drummed. Its celestial lamentations form an eclectic duet with a synth which throws some brief harmonic chords without forgetting to release clouds of ether. It's a quiet and restful track which ties itself very well to "Sea of Tranquility". The duet Koelzner/Meier will return with a slightly more lively structure in "Govinda" which is doubtless the lively piece of music in “Namaste”. A track that takes us out of our state of beatitude after the superb one which is "Sea of Tranquility" and its spirit of the Middle East. The orchestrations spread a dense morphic veil which embraces the drumming of the sequences, while that a delicate aroma of flute is floating with its scents of hypnotism and that the synth throws solos carrier of reverie and of which the caresses at the hearing are sources of bewitchment. If we do not sleep, we are near to contemplation. With amazement, this "Sea of Tranquility" reminds me of Klaus Schulze in his moments of meditation. An impression moreover which describes the character of the dulcet minimalist rhythms and the very melancholic moods of “Namaste” where the fusion of Ruth Koelzner's delicate voice to the opal mists and to the very well nuanced orchestrations pass very well in the ear. A parallel to be made with the duet Schulze/Gerrard? If there is one, that would be at the level of the ambiences which, at times, remind me those of a dreamy and very nostalgic Schulze. Regarding the voice of Koelzner; it seems less powerful than Lisa Gerrard's, but is still rather charming all the same. But all in all, “Namaste” remains an attractive album of a relaxing, a meditative music which is not at all sedative.